Thousands came out on a rainy Friday morning to pay their respects to fallen Delaware State Trooper Cpl. Stephen Ballard. Friends, family, and law enforcement officers from across the country attended services at the Chase Center on the Riverfront in Wilmington, DE. 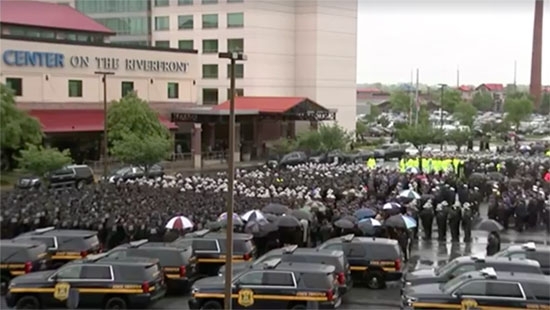 Ballard's casket was greeted by around 2,000 officers standing at attention when the hearse arrived at the Chase Center. They came from Pennsylvania, New Jersey, New York, Maryland, and as far as Canada and California. Former Vice President Joe Biden was also in attendance. Ballard was shot in the line of duty on April 26th after approaching a suspicious vehicle in the parking lot of a Wawa in Bear, DE. The shooter was killed after a 20-hour standoff with police at his home in Middletown, DE. Ballard leaves behind a wife and 5-year-old daughter. Eighteen members of a now banned fraternity at Penn State University are facing charges related to the death of a student who died after falling down the stairs following a night of heavy drinking during pledging. Eight of the frat members are accused of involuntary manslaughter. The others face various charges including evidence tampering to furnishing alcohol to minors. On Thursday February 2nd, sophomore 19-year-old Timothy Piazza of Lebanon, NJ, fell down a flight of stairs at 11 pm following a pledge acceptance ceremony. Medical assistance was not called until 12 hours later on Friday morning when he was found unconscious on a couch. He died two days later. Penn State permanently banned the Beta Theta Pi chapter and halted alcohol related activities at any greek event for the rest of the year. A standoff with police in Gloucester County ended peacefully this morning. It started just before 1 a.m. on the 1000 block of North Main Street near Meadows Drive in Monroe Township. The Gloucester County Tactical Team, Monroe Township Police and the fire department responded to the report of a suicidal man who barricaded himself inside his home. Nearby by neighbors were woken up and evacuated as a precaution since the man had a long rifle. At around 6:45 a.m. the man surrendered to police. No one was injured.